Battles of the Third Age, the first expansion for the best-selling War of the Ring board game, not only makes the experience of playing the core game even greater by adding more figures and rules options, but this expansion also contains a complete companion game enabling you to play the two most important battles for the Third Age: The battle for Helm's Deep, and the battle for Minas Tirith at Pelennor fields. War of the Ring: Battles for the Third Age introduces exciting new figures and game options for your War of the Ring board game. These include the Ents, Corsair Ships, the Dunlendings, Siege Engines, Half-Orcs, Southron Cavalry, as well as the new characters of Galadriel, the Balrog, Smeagol, a new version of the Witch-King of Angmar, and several other exciting rules and additions that will enhance your enjoyment of the War of the Ring board game. In addition to these exciting additions, The Battles of the Third Age expansion contains the materials and rules, including new game boards, allowing you to recreate the epic battle of Helm's Deep and the Battle for Minas Tirith at Pelennor fields. These new games are supported by an innovative new system that uses the new components as well as those in your War of the Ring board game. The engaging game mechanics of the new tactical games includes unit special abilities, terrain effects, event cards, and more! 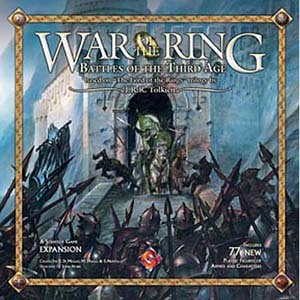 ** War Of The Ring - Battles Of The Third Age Expansion is not a stand-alone game.